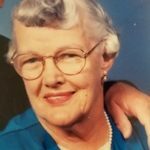 Added by Bill Bowman on March 18, 2019. 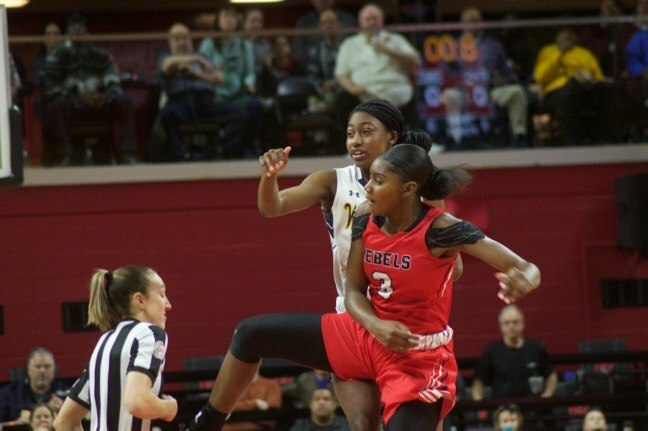 Lady Warrior Diamond Miller powers past a Rebel defender on her way to the basket in the March 17 Tournament of Champions finals. 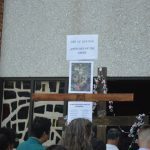 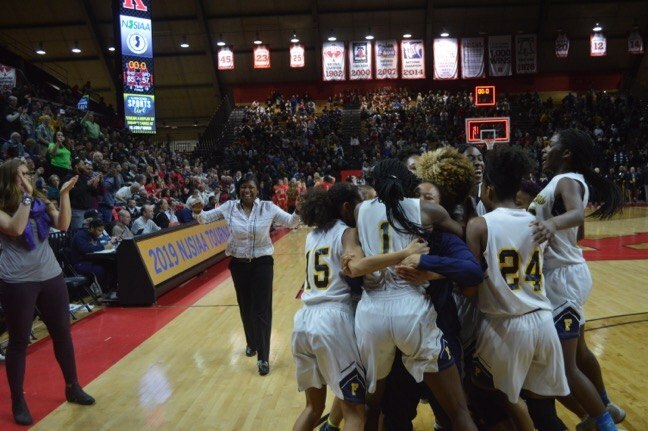 PISCATAWAY – Finally, the emotions came. 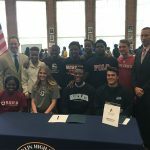 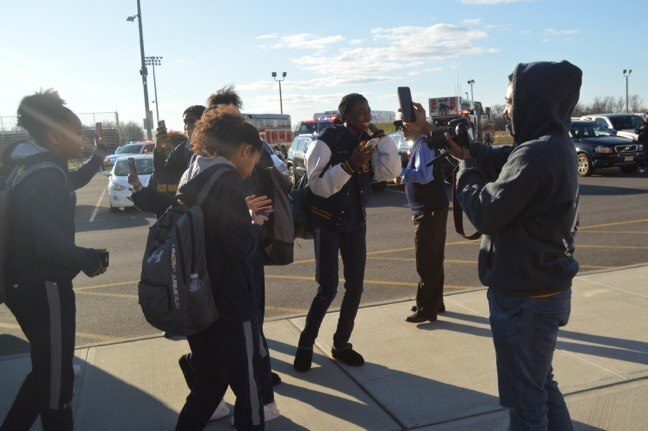 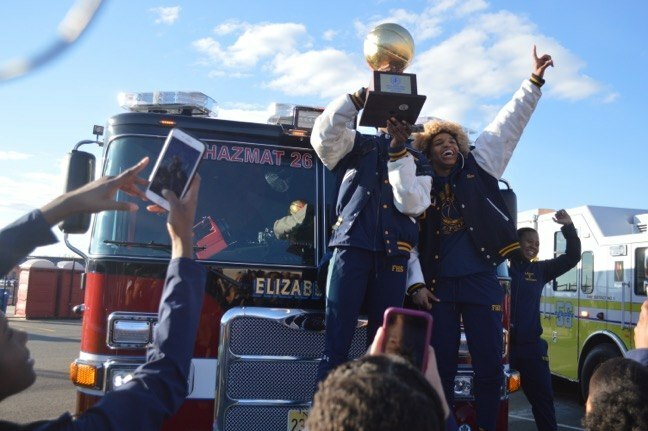 They greeted their wins on the basketball court in the Somerset County championship, the state sectional championship and the state group championship with low-key congratulations, an acknowledgement that there was something more they wanted. 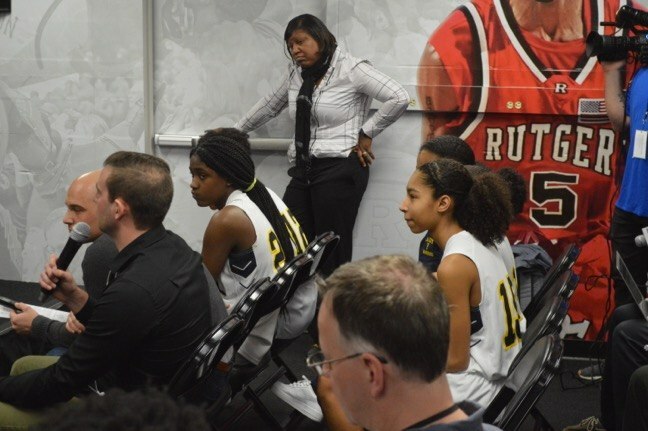 “This is great, but we have more work to do,” was their common refrain. 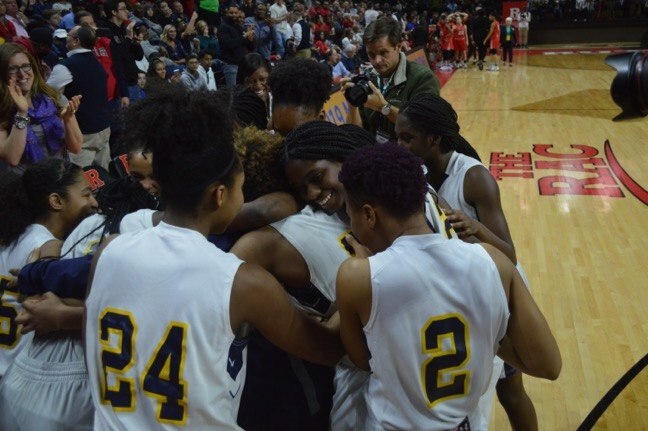 But then, just seconds away from reaching that for which they put in all that hard work during the course of a season that started last year, the emotions finally came out. 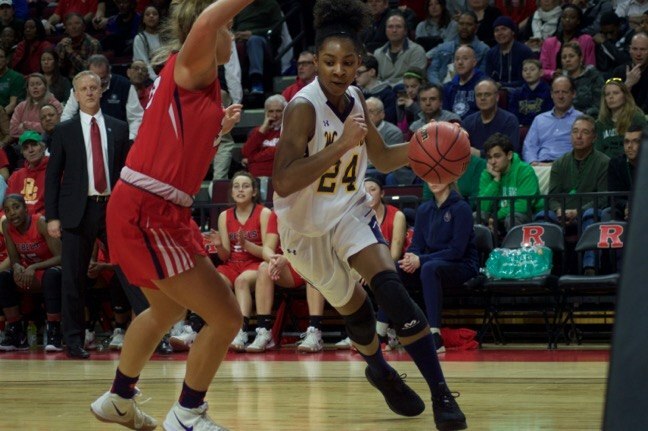 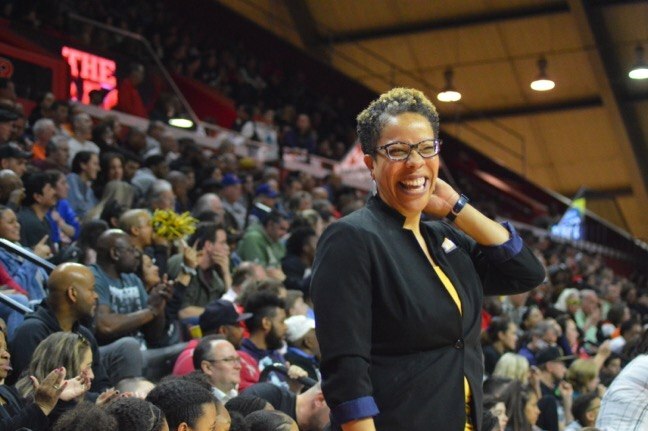 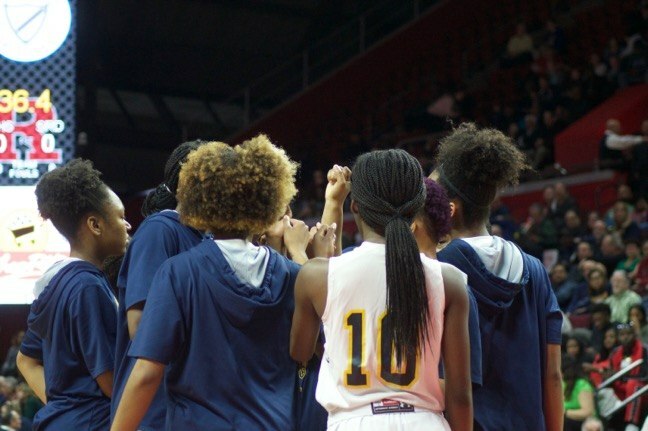 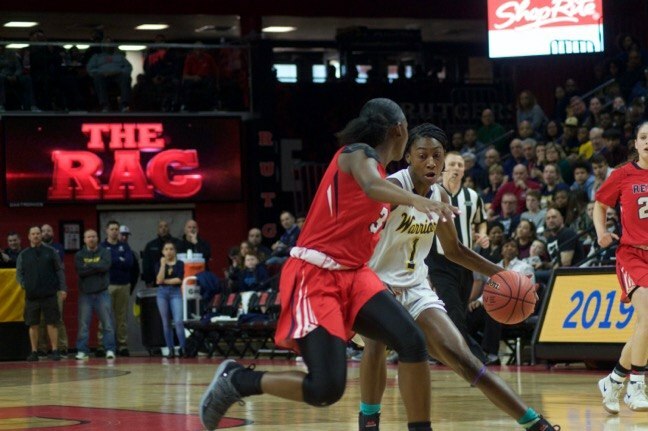 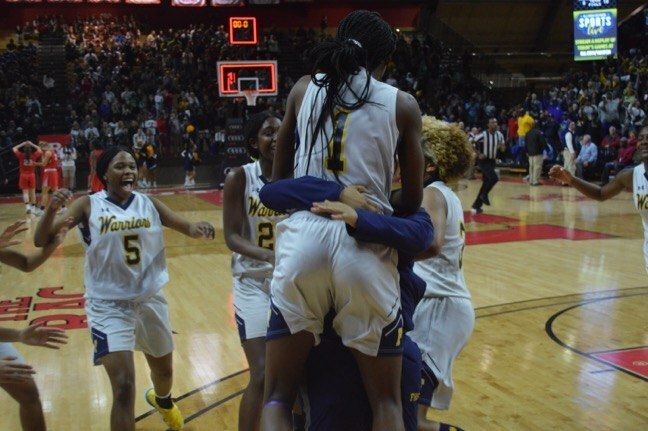 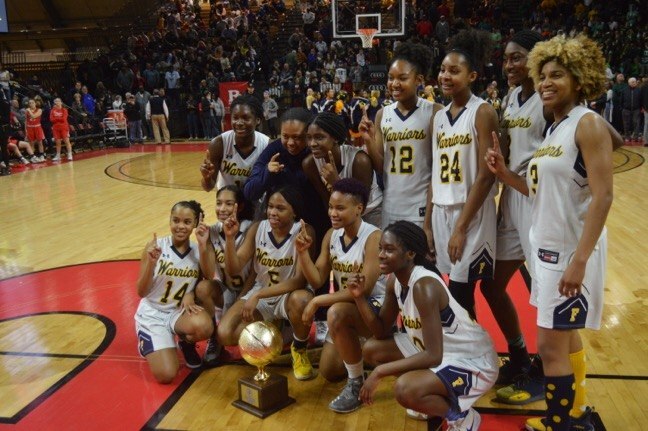 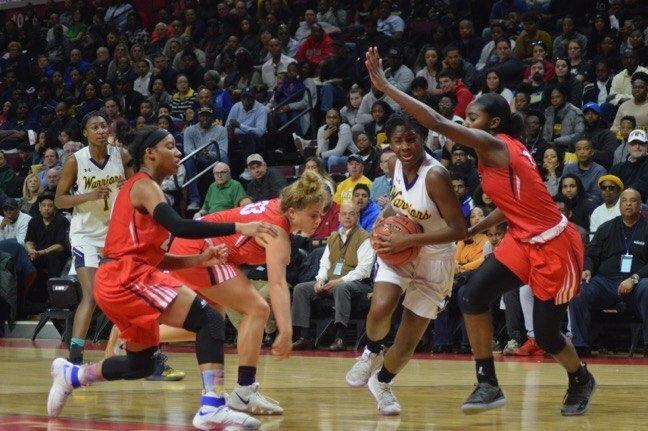 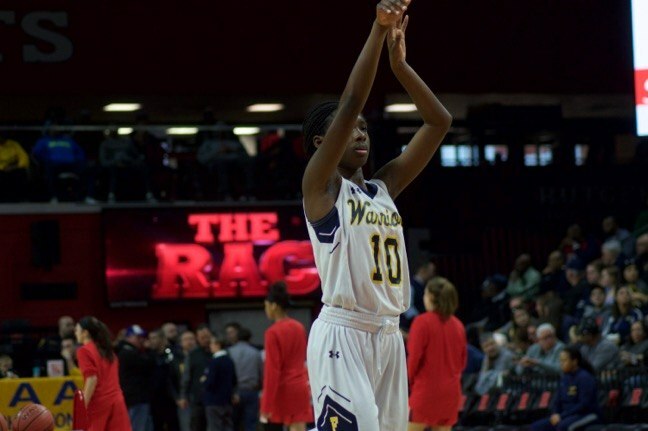 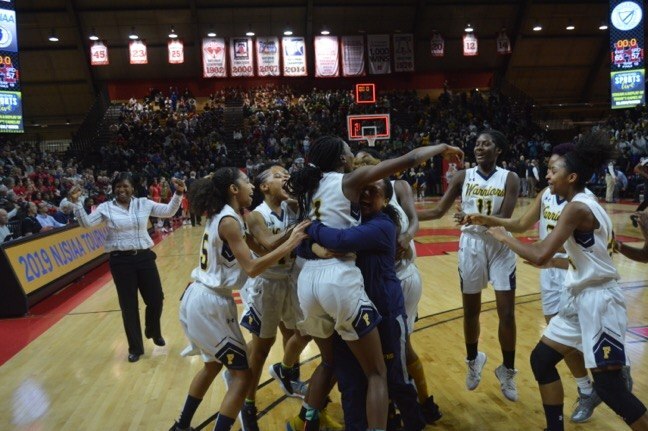 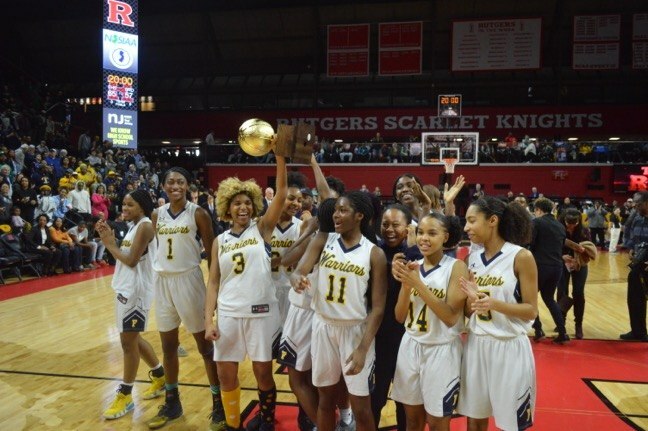 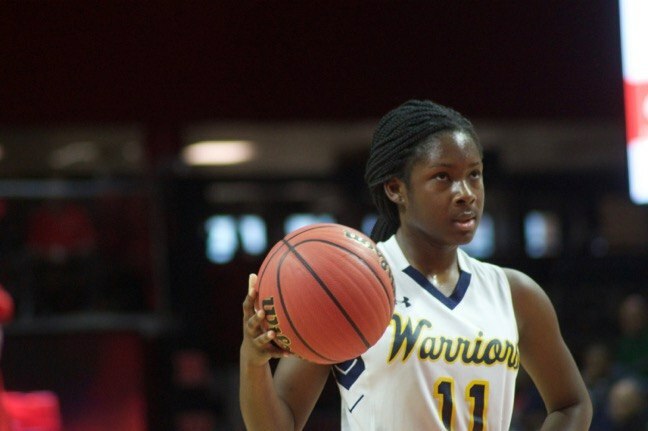 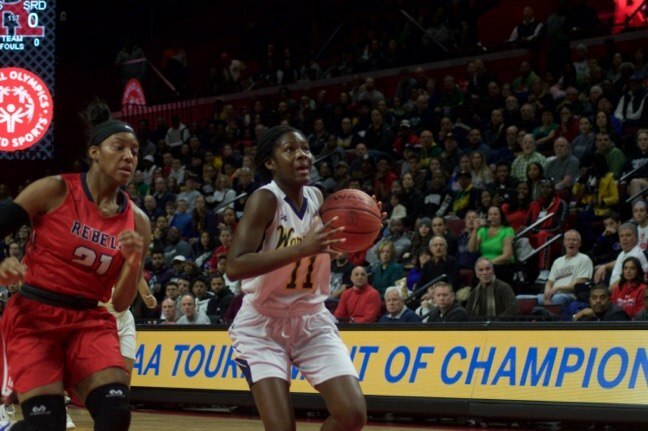 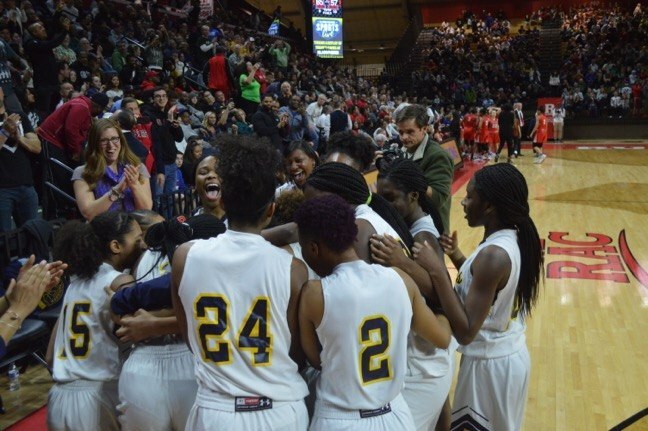 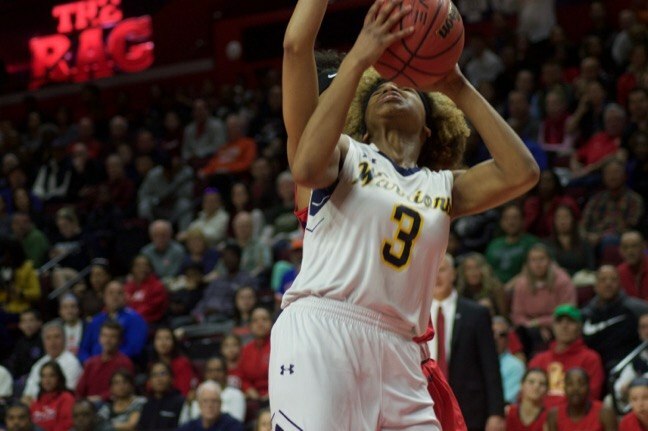 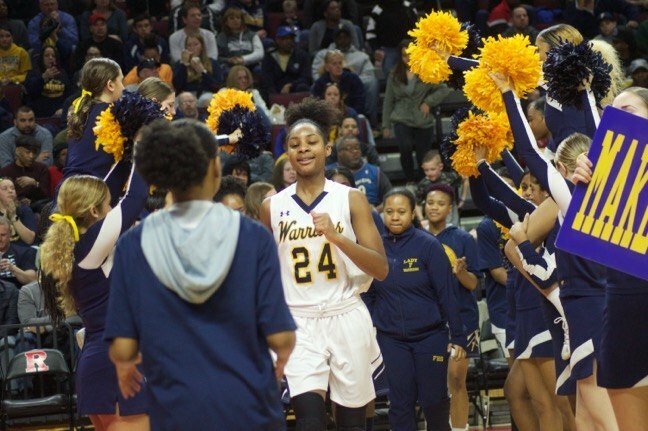 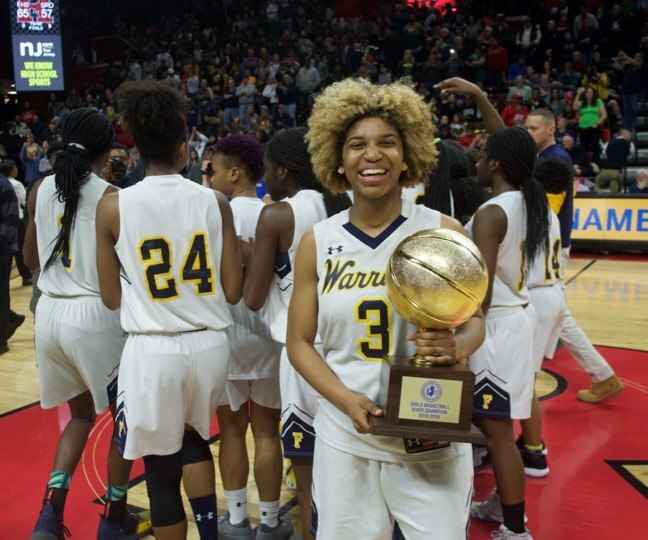 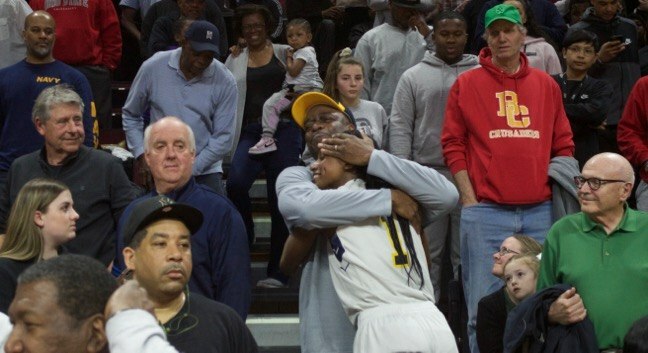 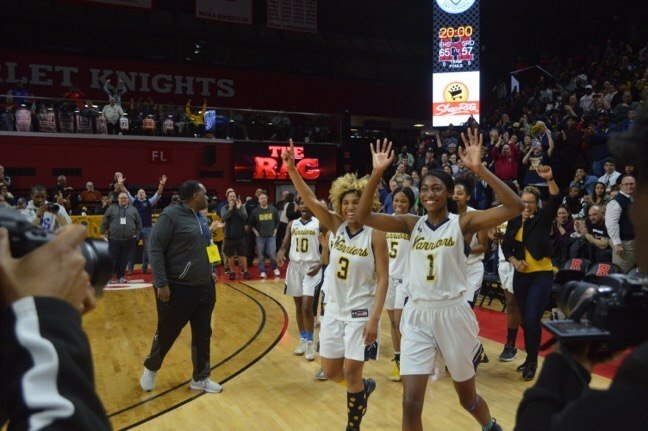 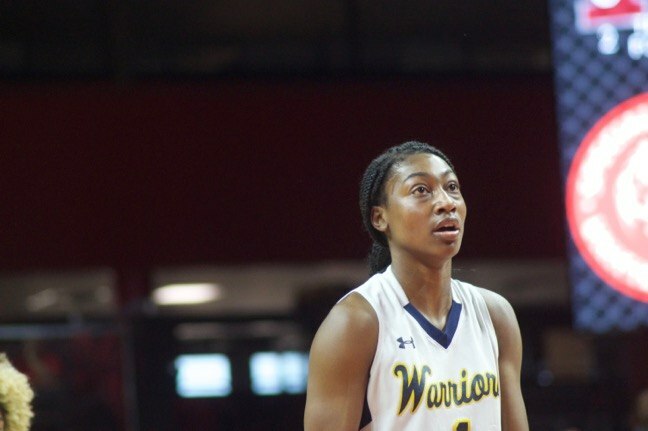 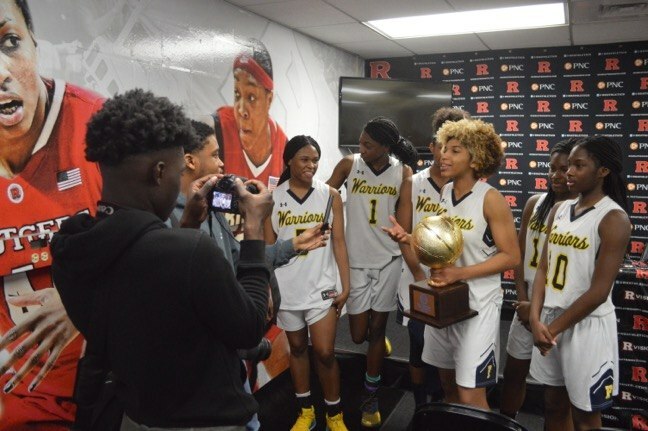 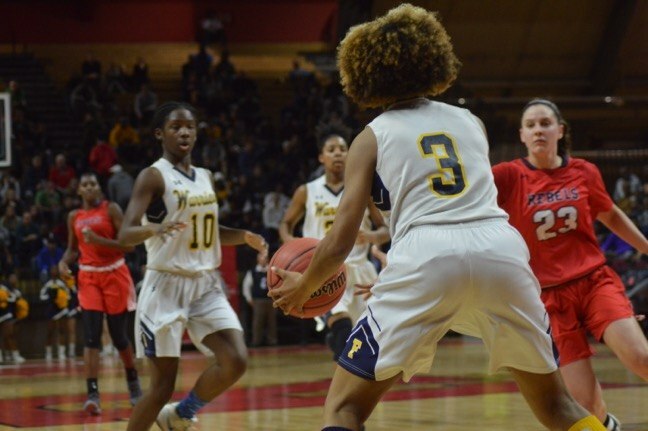 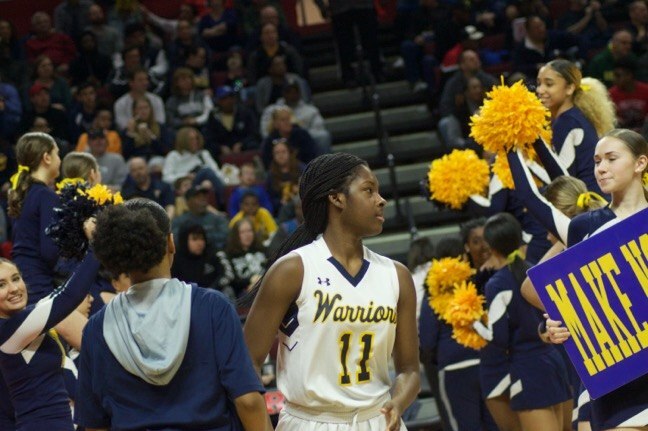 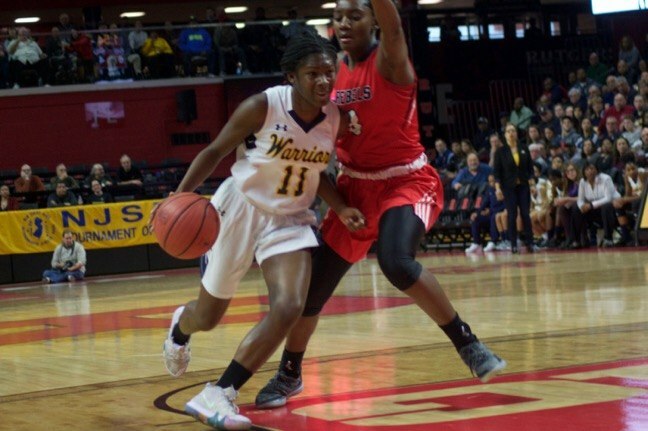 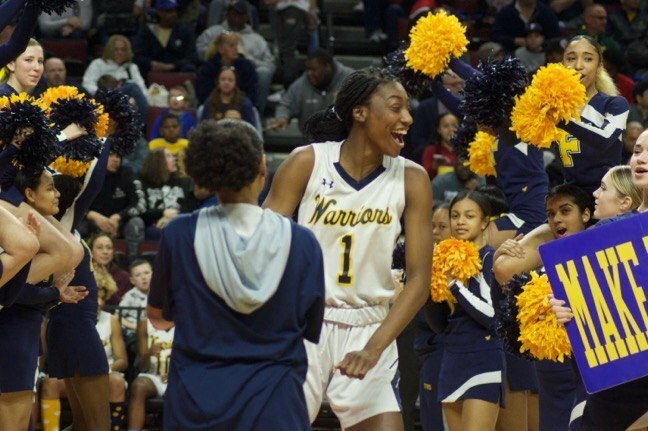 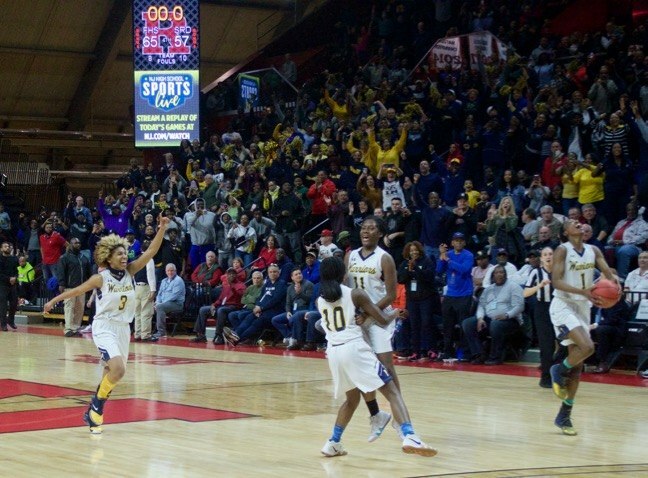 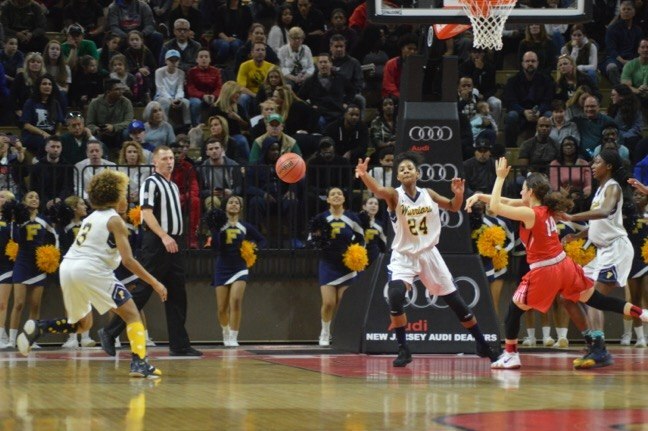 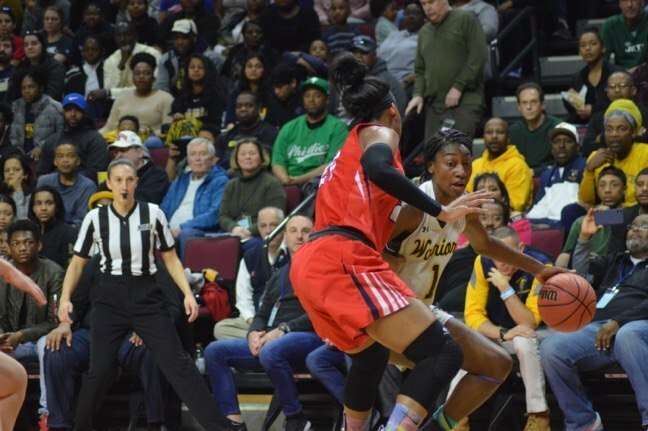 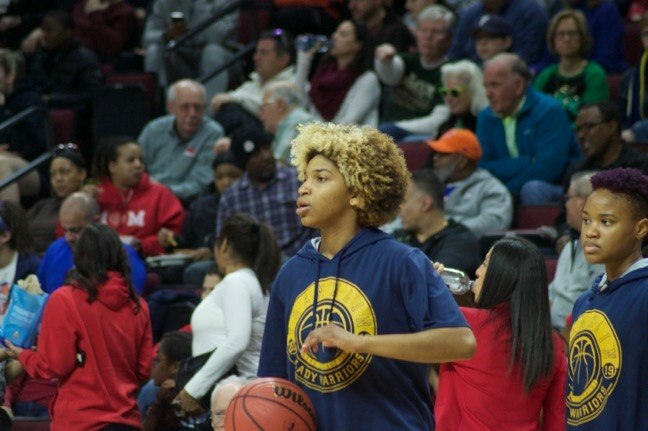 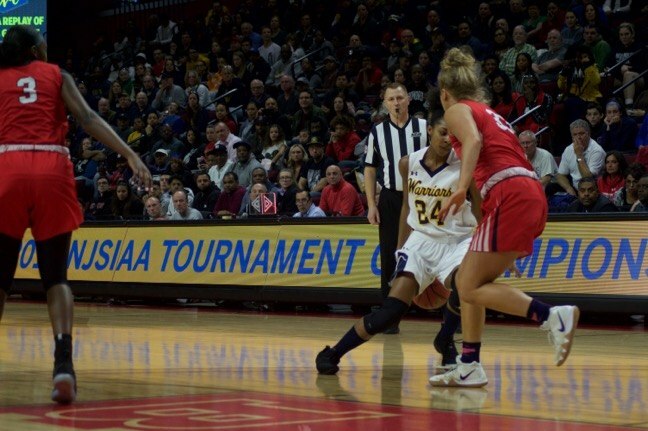 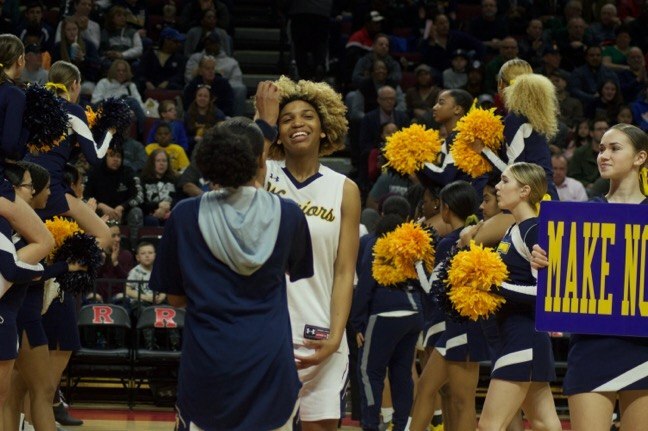 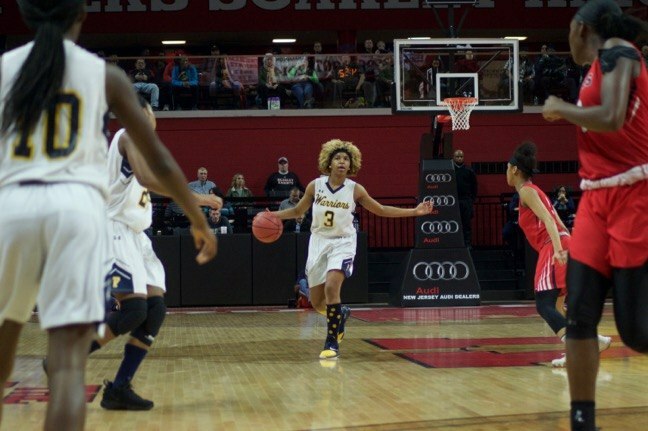 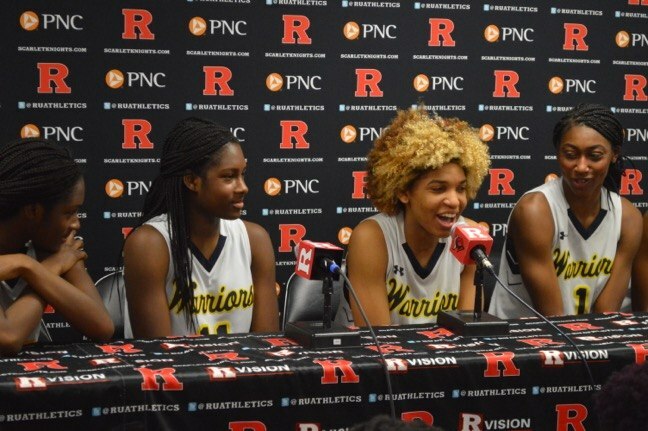 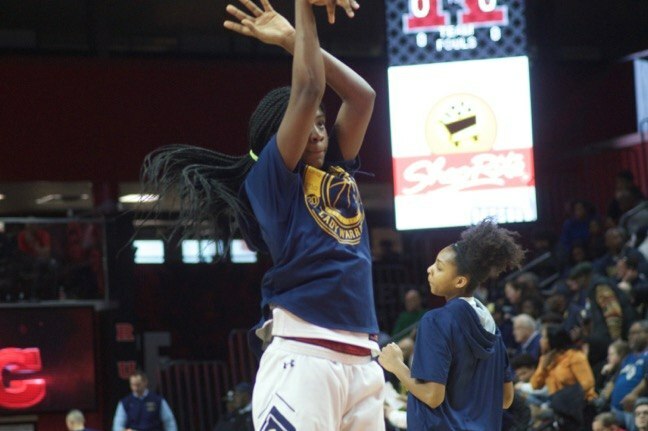 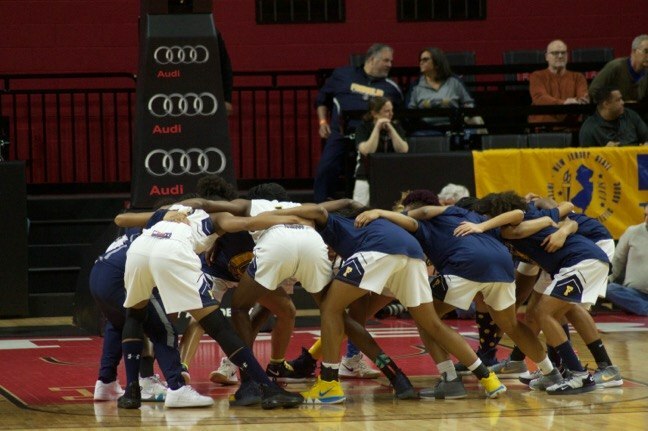 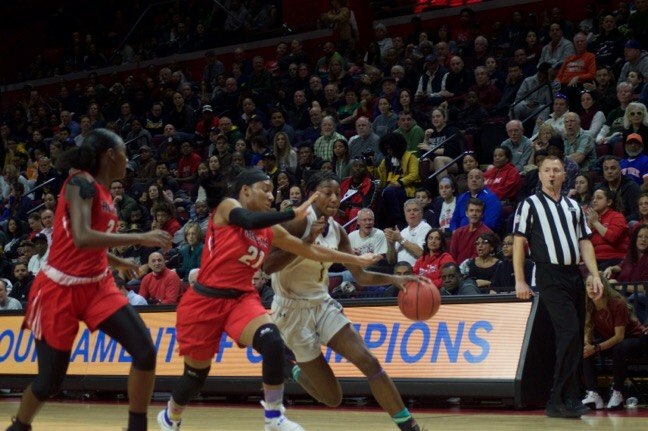 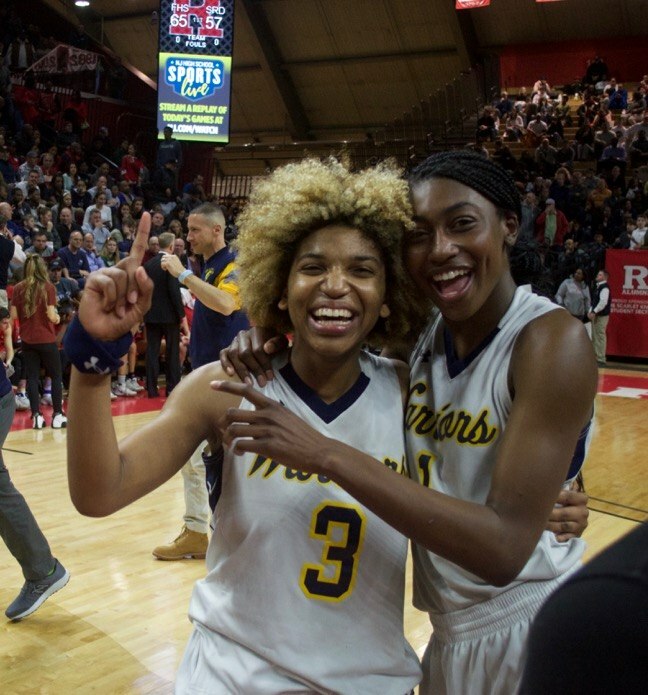 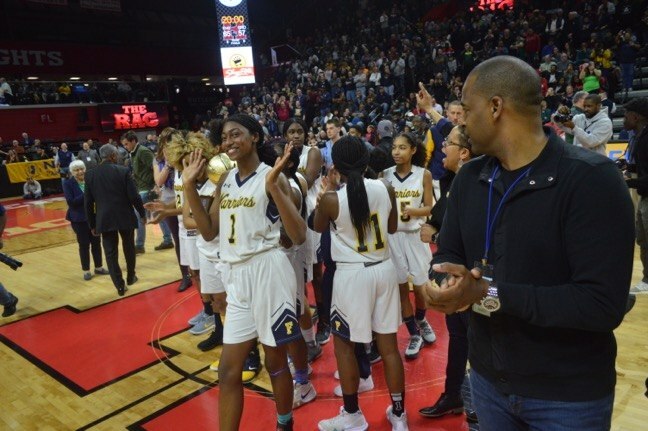 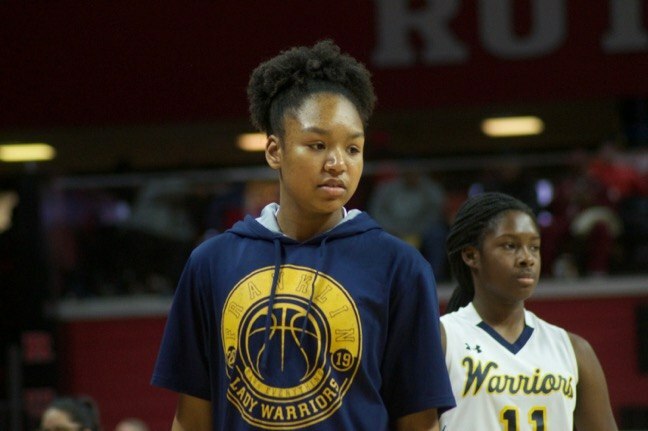 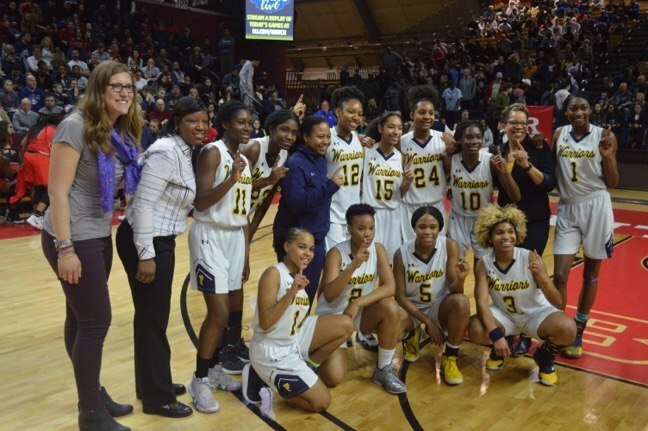 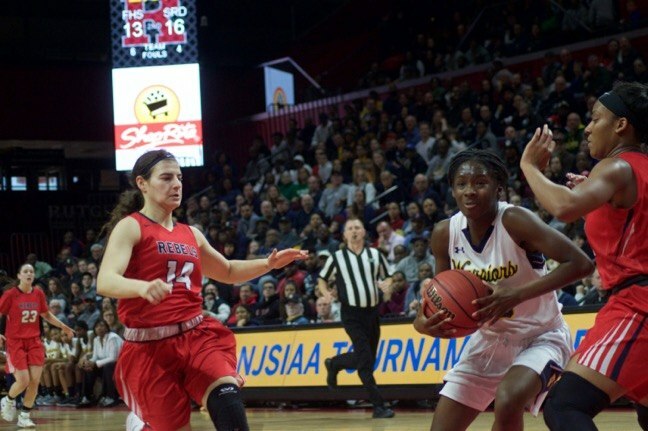 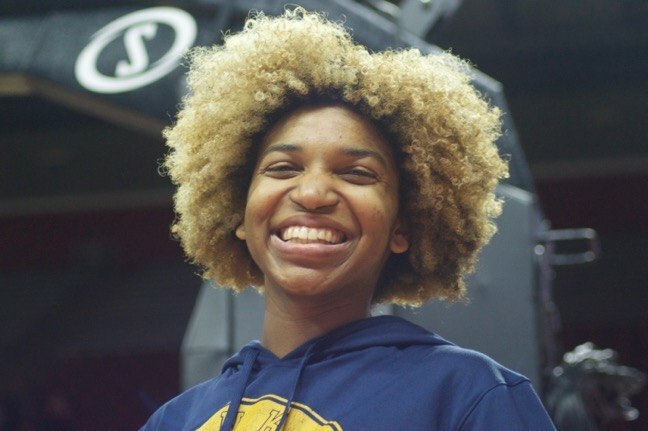 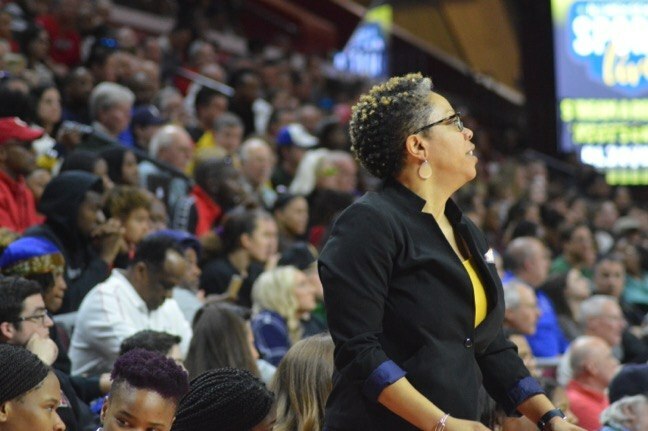 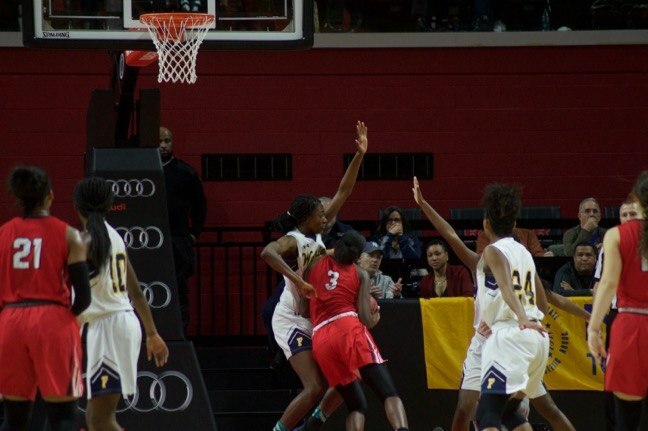 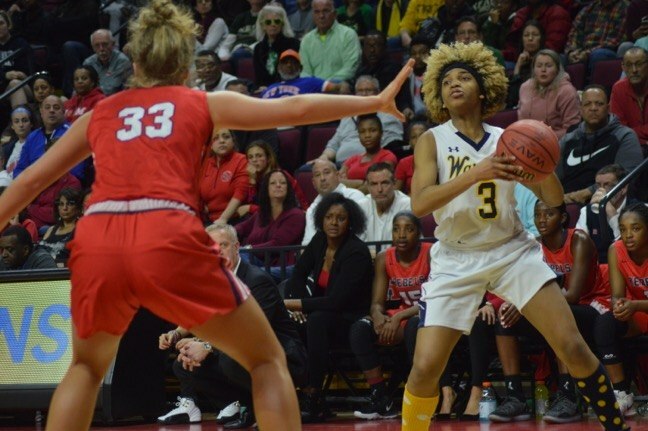 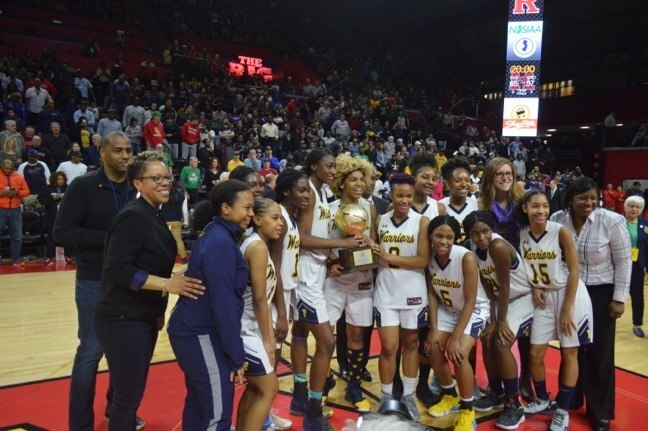 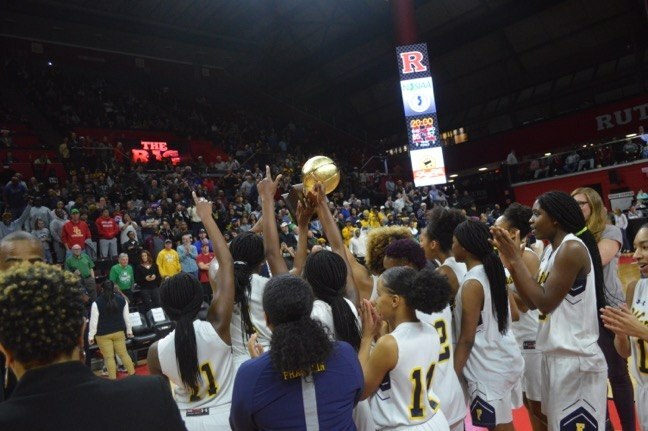 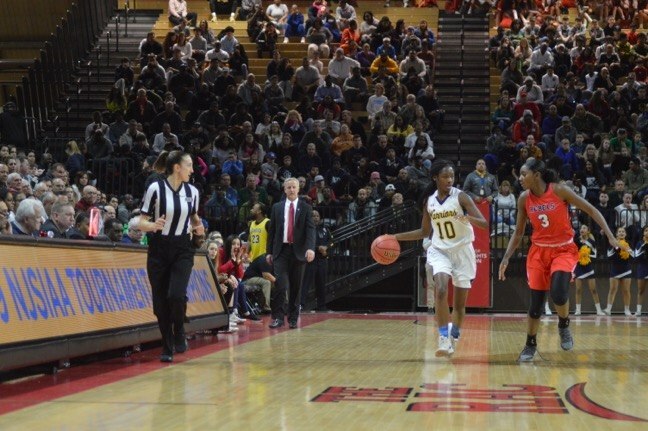 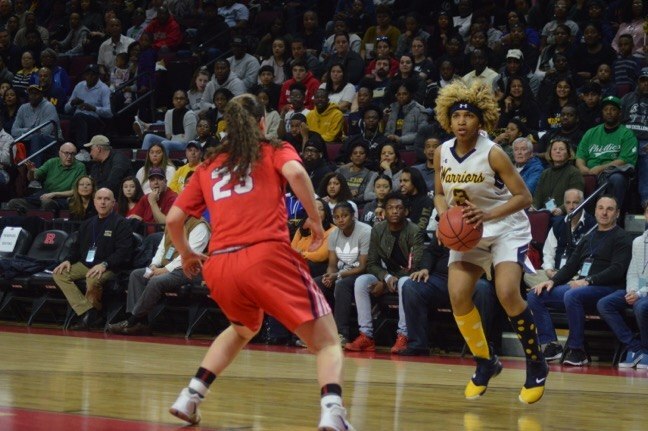 As the last seconds of the 2019 NJSIAA Tournament of Champions final game ticked off in the Rutgers Athletic Center, Lady Warrior Diamond Miller launched the ball in the air and ran toward her teammates, all of whom wore grins as big as their ambition. 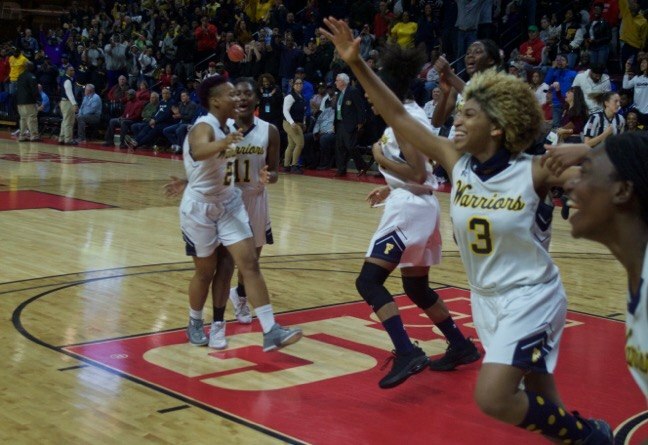 Awash in the cheers of the Warrior Nation faithful who seemingly packed the athletic center, the Lady Warriors hugged each other and reveled in their accomplishment: a 34-0 season, state tournament champions once again and holders of the best record of any high school basketball team in state history. 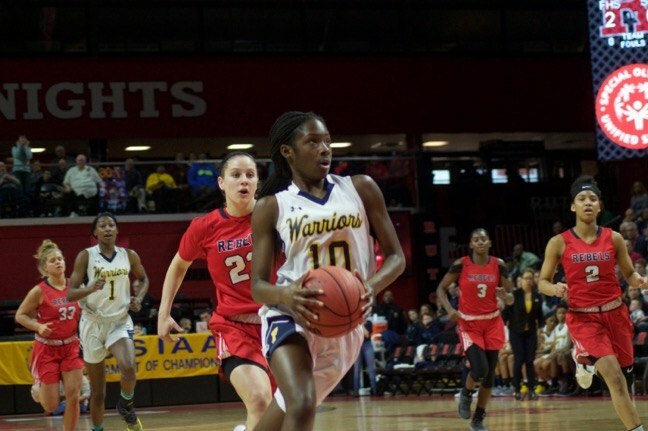 To get past the final hurdle, the top-seeded Lady Warriors had to get past the second-seeded Saddle River Day School Rebels, a team that boasted four Division 1 college commits in its starting five. 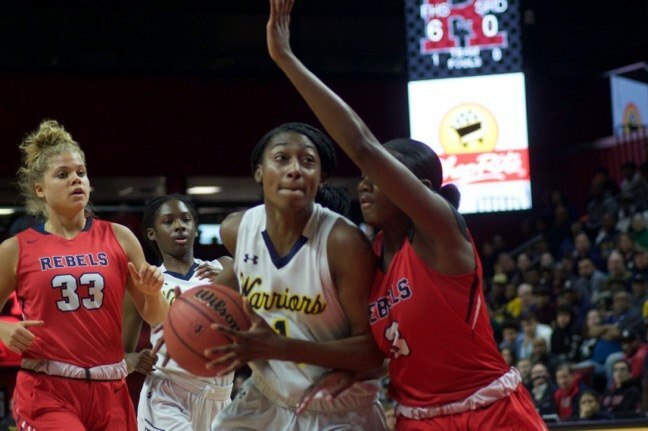 Lady Warriors Coach Audrey Taylor said she wasn’t bowed by the Rebels’ firepower. 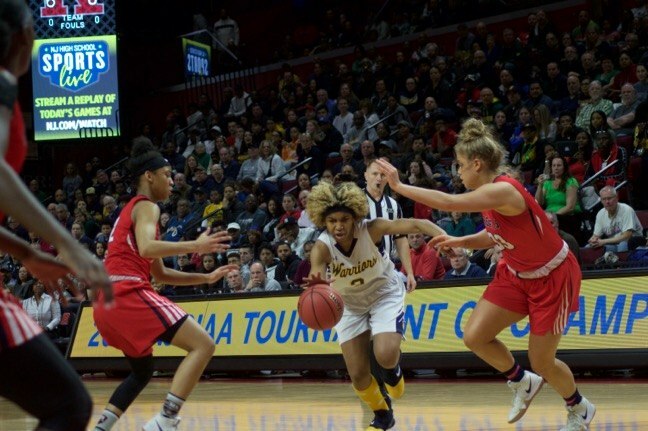 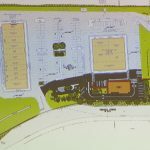 “Regardless if you’re going against a team of D1 commits or not, if you play as a team, it has nothing to do with where they are going, it has to do with who believes in who, which team is going to go out there and have the most heart and finish the game at the end of the day,” she said. 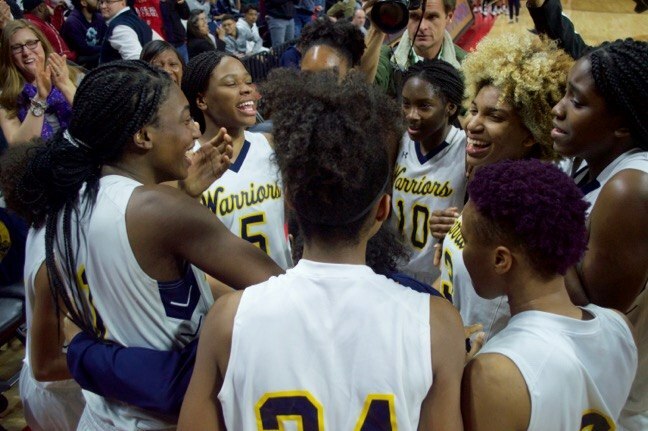 The Lady Warriors certainly finished the game, winning 65-57. 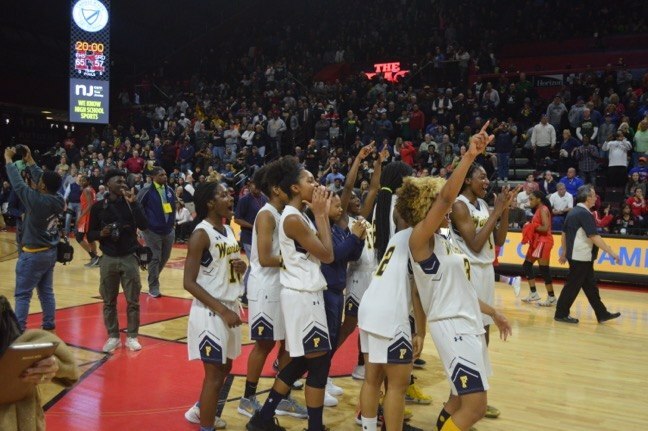 But, as with their semi-final against the St. Rose Purple Roses, the win did not come easily, as compared to the average 30-point blowouts to which Franklin had become accustomed. 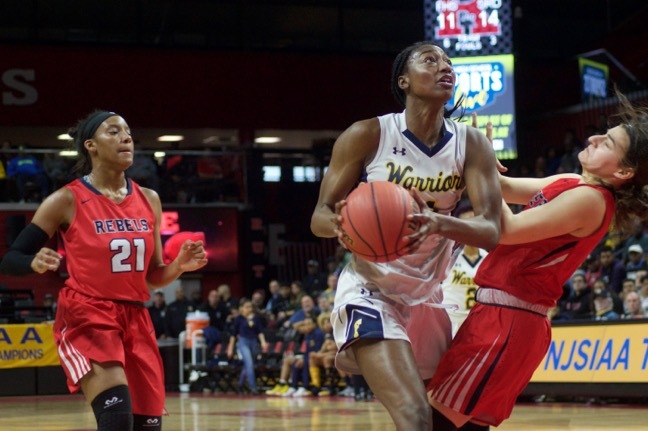 The Warriors got off to a quick start, scoring six unanswered points in the first three minutes before the Rebels sunk a basket. 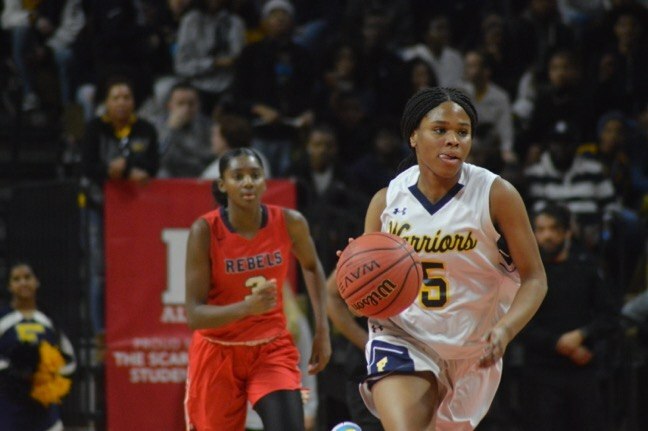 The Lady Warriors took am 8-4 lead, but the Rebels came back to tie it up with little more than a minute left in the first quarter. 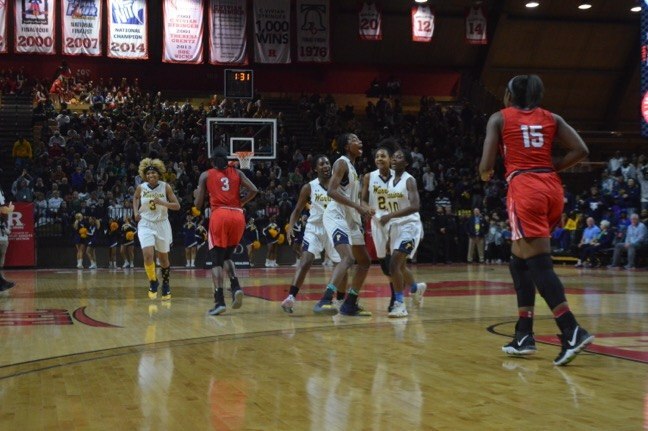 That would be the first of seven ties in a game that saw the lead change 12 times. 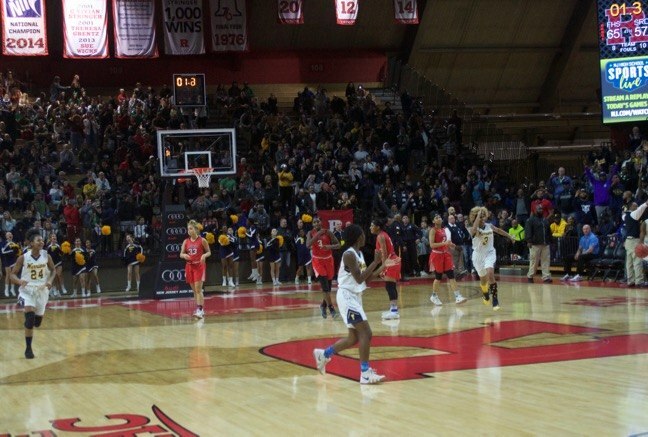 The quarter ended with the Rebels up 10-9, but the teams would trade leads in the second frame until they knotted up at 16, thanks to a three-pointer by junior Kennady Schenck, with just under three minutes to go in the half. 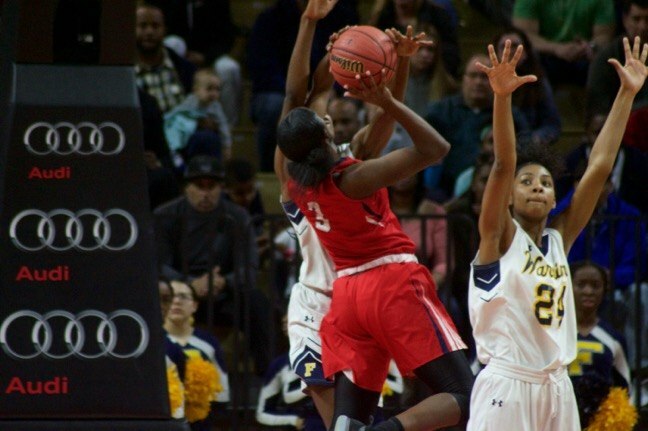 The teams traded leads in the final two minutes of the quarter, until Sydnei Caldwell sunk two free throws to give the raiders a 26-23 lead with four seconds left to play. 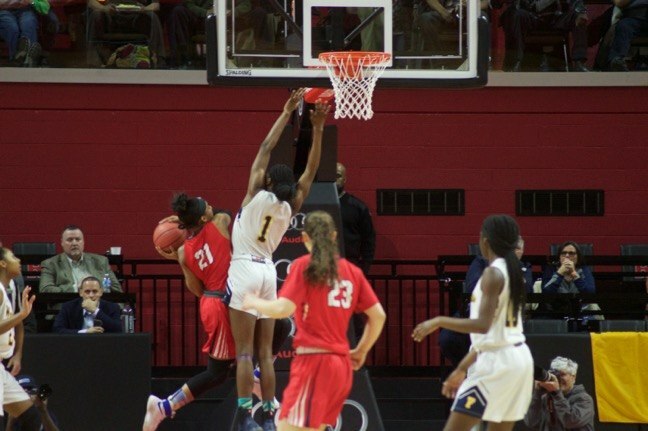 The ball was inbounded to Miller, who drove to a few feet high of the center court line when she unleashed a huge, arching shot to the basket. 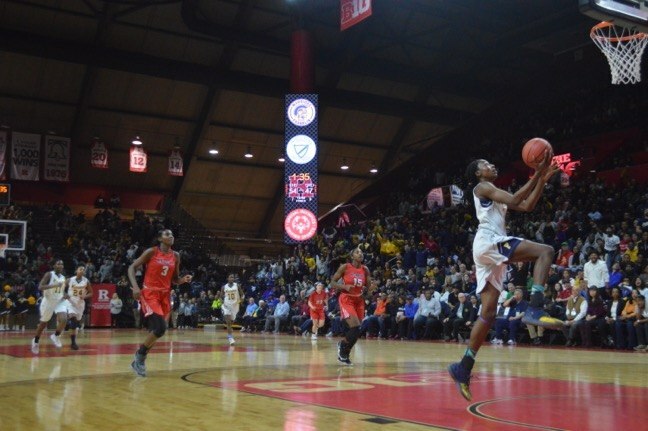 The buzzer sounded while the ball was in mid-air. 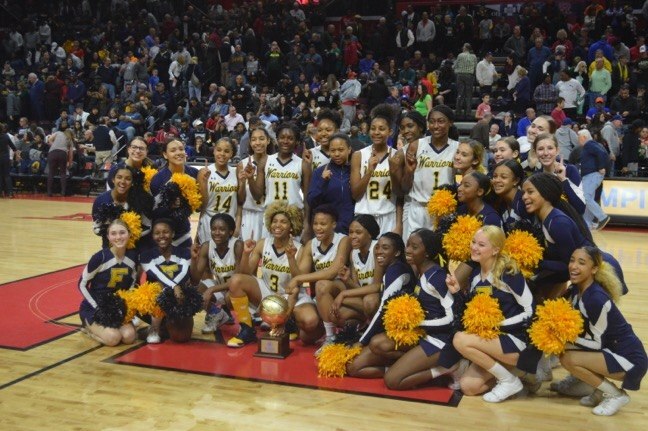 Warrior fans erupted, Diamond hopped and skipped before running into the locker room, and Franklin ended the half tied with the Rebels at 26. 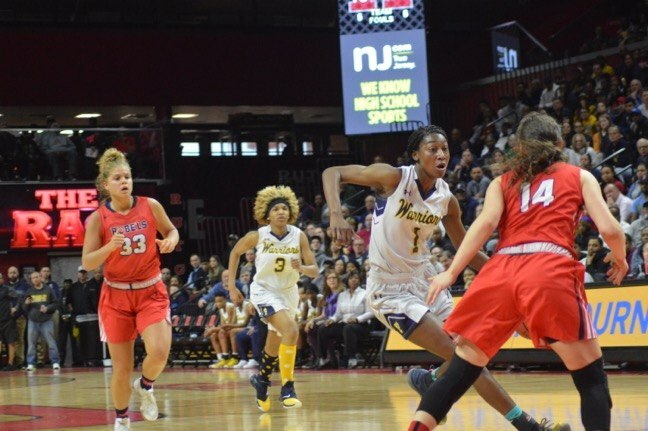 Franklin jumped out to a five-point lead at the start of the third quarter, thanks to a field goal by senior Tiana Joy Jackson and a second-chance three-pointer by Miller. 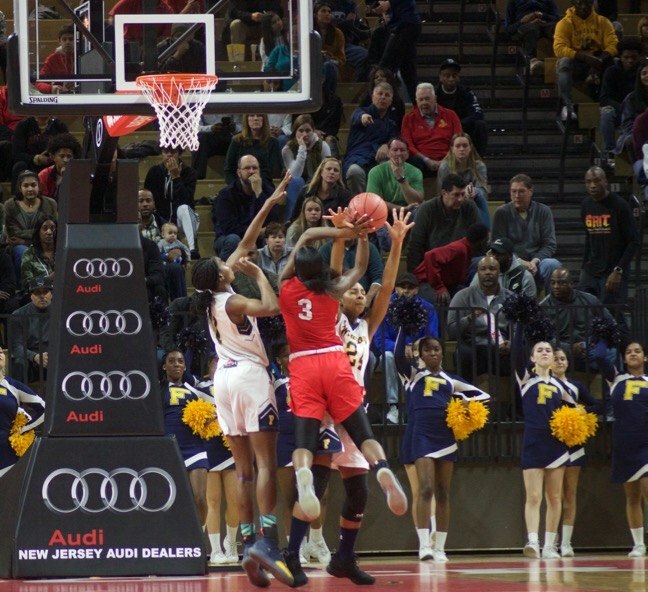 Saddle River Day chipped away at the lead until they once again tied the score at 34. with 3:22 left in the quarter. 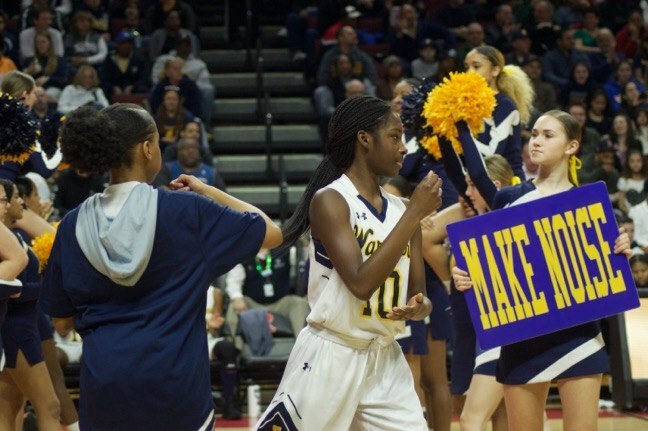 The quarter ended with a 39-38 Franklin lead, thanks to free-throws by Miller and another three-pointer by Keona Schenck. 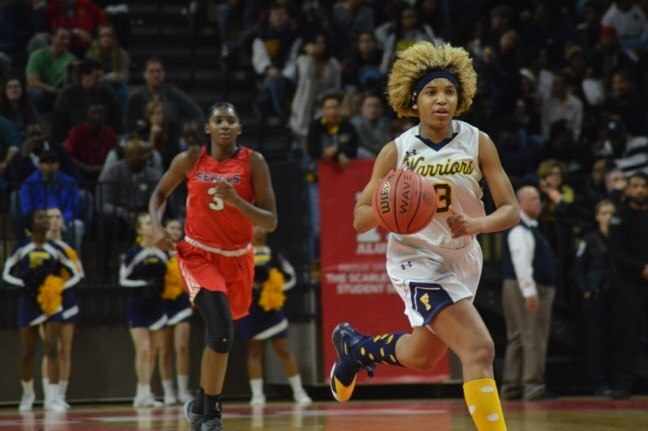 The fourth quarter was all Franklin’s with the Lady Warriors leading by as much as nine points several times in the frame. 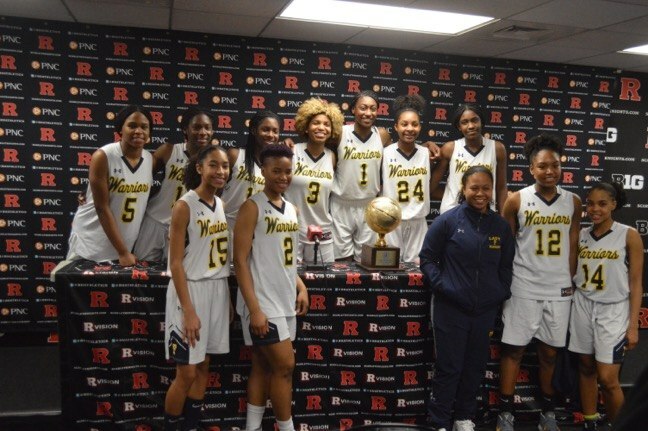 Franklin outscored Saddle River Day 26-19, with 12 of those points coming at the free-throw line. 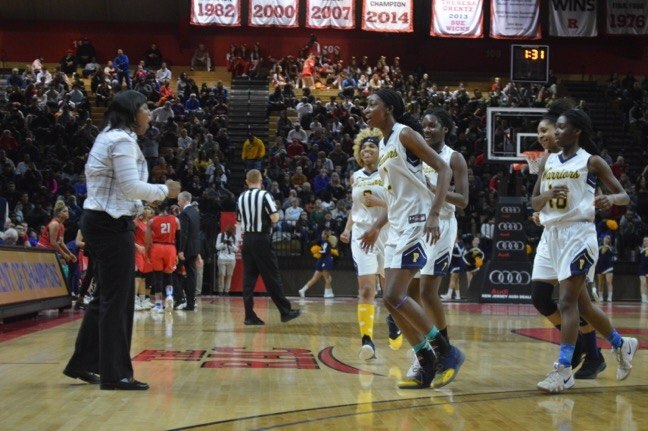 Miller finished the game, and her high school career, with another double-double, scoring a team-high 25 points and pulling in 18 rebounds. 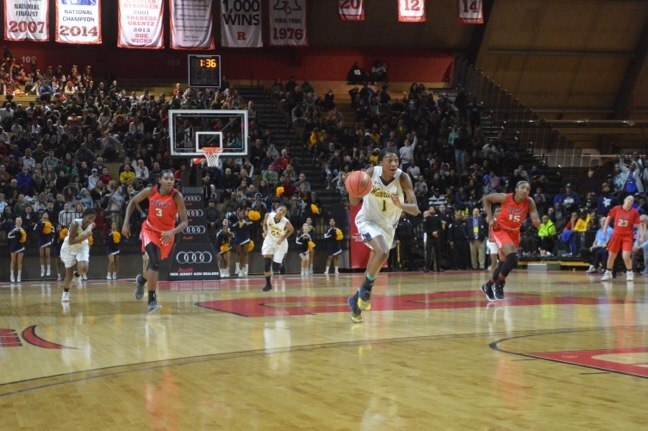 Miller also contributed seven assists, five blocks and a steal. 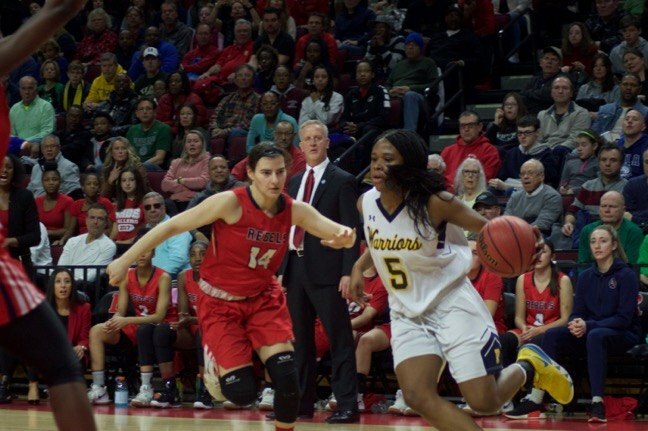 Kennady Schenck scored 14 points, with nine of them coming from beyond the arc. 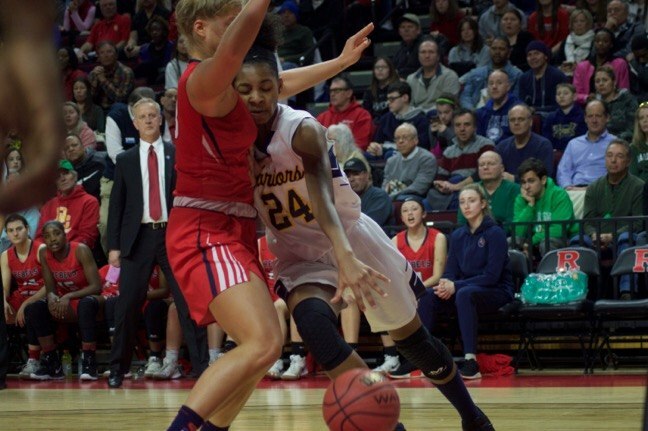 Keona Schenck contributed 11 points to the win, along with seven rebounds. 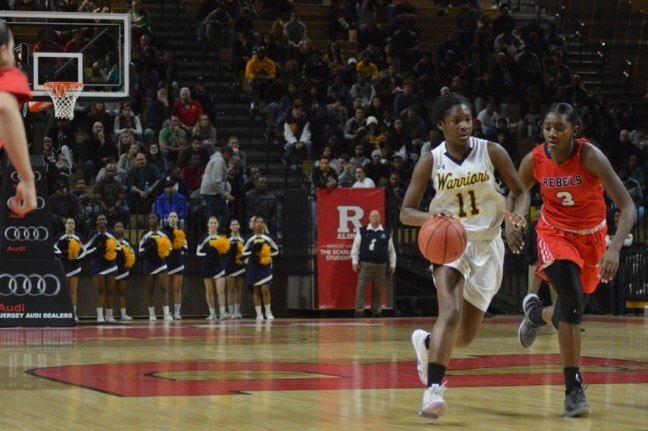 Tiana Joy Jackson scored 10 points with six rebouonds, and Christina Midgette had five points and six rebounds. 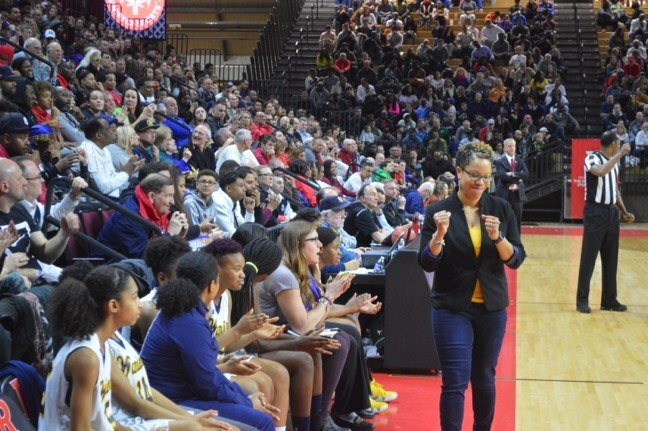 “And I have to tell you, for teenagers to have that kind of composure, that kind of understanding, this is one of the greatest teams I think that I’ve ever seen, and I’m going to call that,” she said. 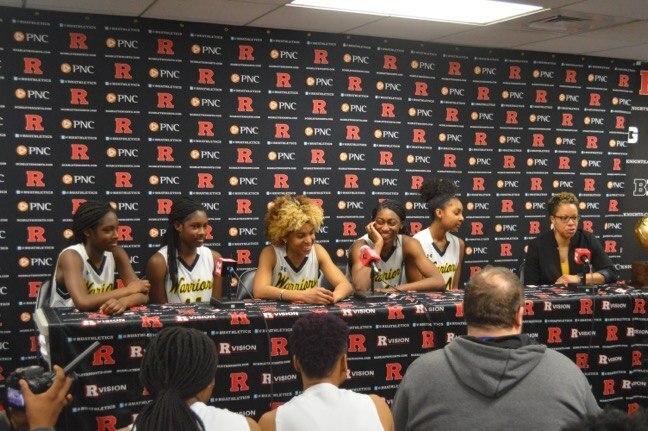 “I’m very, very proud of them, very proud to lead them,” Taylor said. 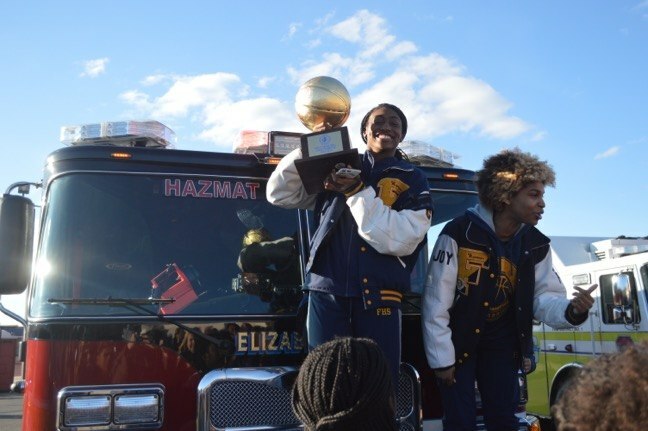 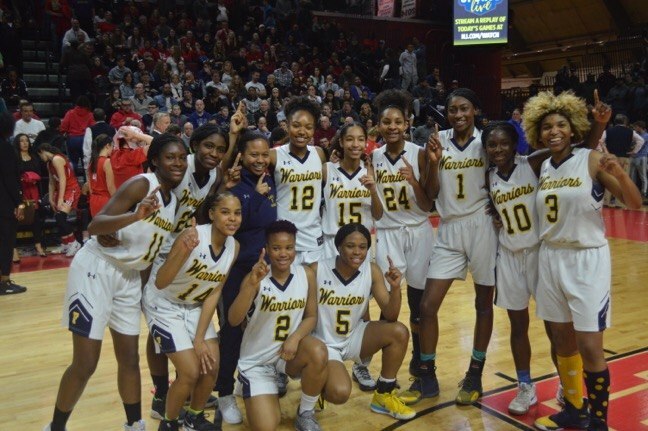 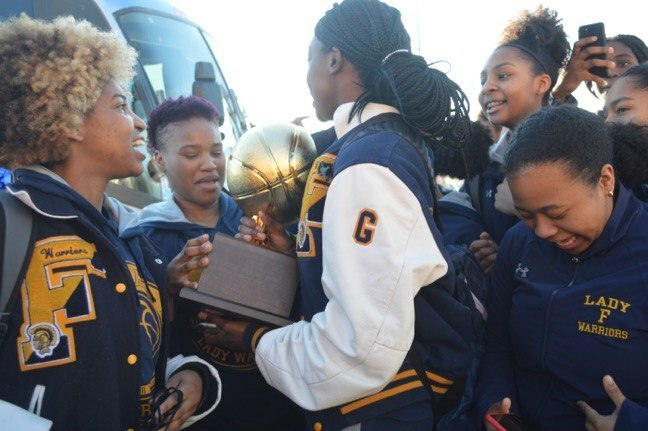 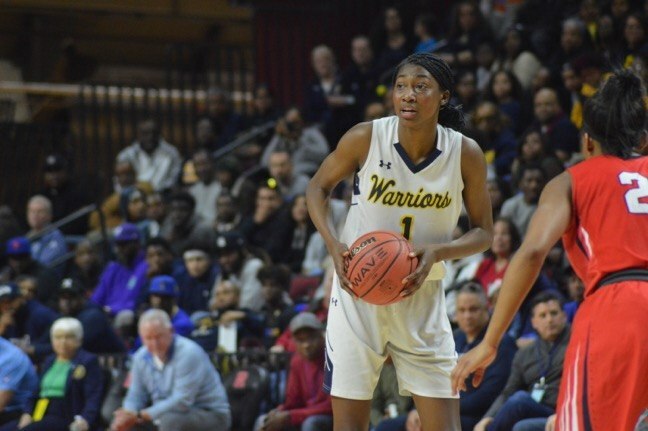 The Lady Warriors have not lost a game since they fell to Manasquan in the 2018 TOC finals. 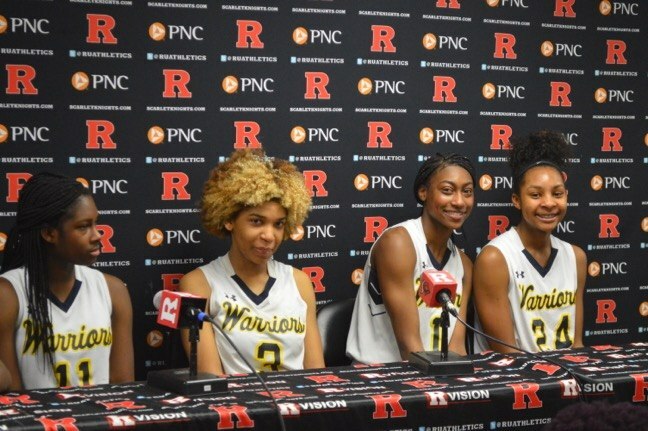 Five years ago, Taylor said, the Lady Warriors were considered a “roll-over team,” but that all changed. 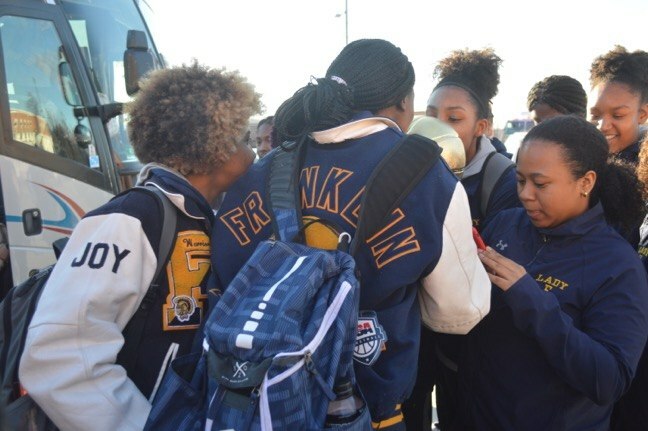 The undefeated Franklin High School Lady Warriors basketball team triumpahntly returns to FHS after having clinched an historic season with their victory over Saddle River Day in the Tournament of Champions championship game before 6,100 people at the Rutgers Athletic Center.With the win, the Lady Warriors finish the season 34-0, and rank as the greatest high school basketball team by record in state history.